Not everyone has the vision of a cat at night – but that doesn’t mean you cannot enjoy your game of golf even though you’re whacking away in poor light conditions. 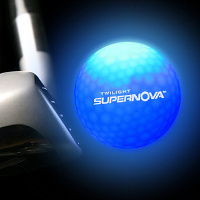 This unique £29.99 Twilight Supernova is a professional-quality golf ball which will feature built-in impact-activated LEDs. Once you tee off (or having some bunker issues, trying to chip your way through), it will flash rapidly to the tune of 7.2 times per second – and remain that way for up to 8 minutes. That ought to provide ample time for you to see the ball long enough and walk to it, don’t you think so? Not only that, there is a back-up plan with the Twilight Supernova. The moment the LEDs stop flashing, Supernovas patented After-Glow technology kicks in to make sure the ball will be able to glow brightly for several hours more. Available in blue, green and white colors, they look positively radioactive after you’ve given it a good whack. The built-in battery is able to last for around 40 hours or 300 hits whichever comes first, and I think it might even make for an alternative toy for cats to chase around with at night.